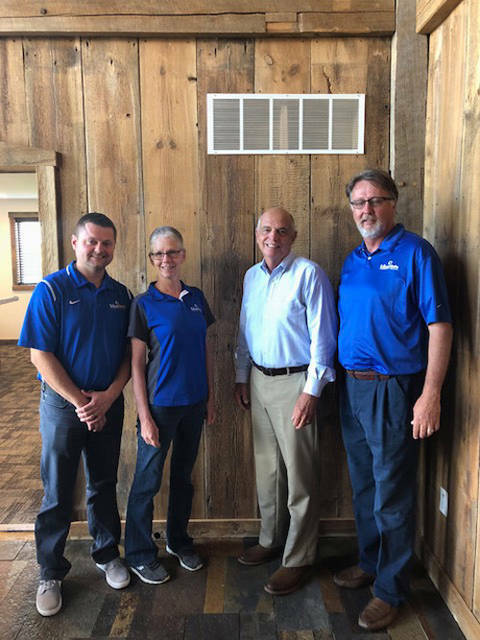 Edison State administrators Chad Beanblossom, vice president of regional campuses; Dr. Doreen Larson, president; and Tom Milligan, board of trustees chairman; meet with Bill Dues, president of the Preble County Youth Foundation. EATON – Edison State Community College announced yet another campus location set to open in Eaton. The announcement comes on the heels of the Troy campus expansion announced earlier this year. Edison State Community College is partnering with the Preble County Youth Foundation to bring accessible and affordable higher education to the region. The campus location presents the opportunity for credit and non-credit programs, including College Credit Plus coursework, degree and certificate courses in agriculture, agribusiness and ag education, transfer pathways to both in- and out-of-state four-year institutions, expanded articulation agreements with Miami Valley Career Technology Center and support to regional businesses with response workforce training and apprenticeship opportunities. “The demonstrated success of Edison State in developing and delivering agriculture degrees and community programming along with our unsurpassed success in workforce partnerships creates a perfect scenario for us to fuel the educational and economic progress of the county,” Larson added. “We also want to build upon our success in offering family-friendly College Credit Plus services currently found at National Trail and Preble Shawnee to include all school systems in the county,” Larson said. “We are in the process of connecting the Eaton Learning Center to the Edison State service systems along with other logistics needed to open the site for business,” Larson said. According to Chad Beanblossom, who has recently been promoted to vice president of regional campuses – leading Darke County, Preble County and Troy campuses, the Edison State Campus at Darke County has historically drawn students from Preble County.